Falin Kitsch lives with her father, stepmother, and siblings in a society called the Sanctuary. The story takes place in a modernistic time where killing people is the main form of entertainment. The people of this society have to wear a halo. A halo is a piece of metal filled with drugs that control the citizen’s emotions. Kitsch is a fighter, and she makes her family proud by killing people. Eventually, a match puts her against her training partner who she is friends with. She kills him, but he rips off her halo. Afraid of being caught, she hides her truth about her torn halo from her family. Later on, the partner’s sister tells Kitsch that her friend’s halo was broken as well. She advises Kitsch, nicknamed Kit, to run away from the city. Kit decides to run away. Kit follows the river, and soon reaches the other side of the fence. She meets a stranger who guides her. The stranger, Ryka, becomes one of Kit’s closest friends. She asks to get her halo fixed, but she is unsure if she wants it back on her or not. Kit finds her sudden dislike for killing people. She realizes that the halo takes away the dislike. 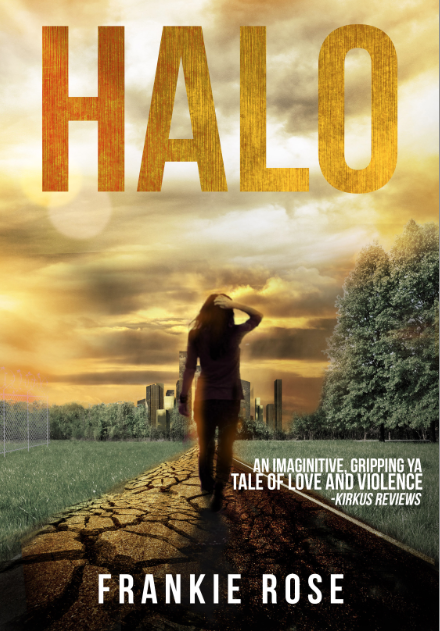 The halo is something that is required in her society, but she learns that it is not required to live. Along the journey of finding herself, she finds new friends, love, and strengths she never thought she had. This book was often hard to put down after you first pick it up. The book is the first book of the series. I am going to read the second book very soon. The author has the ability to make me feel the same emotions that the characters feel. When one of the characters feels sad, I also tend to feel sad. When I first looked at the book, I felt that this book was going to be a difficult book for me to read. Instead, the book includes vocabulary words that are above standards, but not too above standards. “Halo” is not difficult to comprehend, but not too easy either. I would recommend this book to ages thirteen to seventeen. This is a great book to improve your vocabulary and comprehension skills. It has a great plot and an amazing ending that makes you want to read more. I would give this book ten stars out of ten stars. 1. What mistake does Kitsch make when the interviewer asks her a question? 2. What does it mean to be a Falin? 3. What do ribbons symbolize for the fight? 4. How does Kit have to go out of the city? 5. Why does Kit think that she will not be welcomed in Freetown? 6. Why did Cai not act romantic with Kit? 7. Why do the priestesses put veils on their faces? 8. Why does Ryka want to train Kit? 9. Why does Olivia want to become a priestess? 10. Why did Ryka’s father carve his family’s initials in a rock? 11. Why does Kit feel awkward to stay at Ryka’s house? 12. Why does Bartholomew suggest that getting involved in the Sanctuary’s matter is foolish? 13. Why would the group go into the Sanctuary during a match time? 14. Why does Ryka agree to leave the group astray and to get Penny? 15. Why does Kit’s brother not feel any pain?